We have visited several hundreds of villages, where it was presumed to be arsenic free. More and more areas are now extremely arsenic contaminated and poor villagers do have any alternative but to drink poisonous water. It was reported that and reported groundwater of Rangpur, Jamalpur, and Bogura districts were safe to drink but now in many villages of these three districts contains arsenic in groundwater above 0.05 mg/l (50 times higher than WHO standard) and many people are suffering from arsenical skin lesions. Over the last four years, the Arsenic Mitigation Project has succeeded in spending only about five per cent of its fund, that too mostly in the form of office rent, staff salary among others, as there was no drive for field work.... .... The BAMWSP was to undertake surveys to properly identify the problems and viable safe water alternatives in about 200 upazilas out of 265 that were identified as hot spots in respect of arsenic contamination. Another 45 upazilas were earmarked for work by the Department of Public Health Engineering (DPHE) and the Unicef (United Nations Children's Fund), 15 by the World Vision and eight by the Danish International Development Agency (DANIDA). Work in these upazilas progressed well, but the nearly 200 upazilas directly under the BAMWSP remained uncared for....Lack of work during the last four years might have brought many people taking arsenic contaminated water to the brink of arsenicosis, the first stage of arsenic- related ailments. They could be cured simply by ensuring the supply of arsenic-free safe water.... (Independent, 28. 06. 02). It is surprising to find there are still people in Bangladesh who are unaware that an arsenic disaster has overtaken the country. Those who have heard about arsenic however, it has become a by-word or a topic for discussion but for those who are forced to drink the contaminated water because there is no alternative available, it is a tragedy because it could mean a death sentence. This is more poignant because many tube wells that only a year back were coloured green meaning safe to drink are now coloured red meaning contaminated. As such we can expect a rise in the number of cases of arsenicosis. With evidence that contamination is increasing in some districts, we must be more on our guard than ever and the day may be at hand when the only arsenic-free source of water in Bangladesh will be surface water. Give us pure drinking water but don't advise us if you cannot give arsenic free tubewells," people of Gopinathpur union of Manikganj district said, reports BSS (GOPINATHPUR (Manikganj, Gopinathpur union is a severely arsenic-affected area in Manikganj district. About 85 per cent tube wells in the area are marked with red paint to warn that their waters are contaminated by arsenic). However, we could not agree with the finance minister who sometime ago aired the view that the arsenic problem has been overplayed. Such a statement smacks of political overtone and is actually distant from reality. Some 55 million people, or almost half of the country's population, are currently at risk of arsenic contamination, which, by itself, is an indication of the gravity of the crisis. The LGRD minister has hit the nail in the head when he said that despite significant success in marking out affected tubewells, some three crore people across the country drink arsenic-contaminated water. The government needs to find alternative ways to supply safe drinking water. There have been much talk about rainwater harvesting, surface water treatment, etc. However, no comprehensive programme has yet been taken in this regard. Time is of crucial importance here. With each passing day users of arsenic-contaminated water are getting closer to a point of no return. In the absence of treatment for arsenicosis, prevention of the use of arsenic-contaminated water remains the only remedy. Failure to provide arsenic-free water is depriving millions of that chance, too. The number of people in Bangladesh drinking water contaminated with arsenic of above 0.01 mg/l, the WHO guide line value and above 0.05 mg/l, the maximum permissible limit in drinking water of Bangladesh is a cause of concern. Although, time to time, predictions on number of people exposed are made on the higher side but the scientific basis of the report is not available (Pratham Allo, Dec 20,1999; Dhaka, Bangladesh). One can ingest low doses of arsenic for eight to 14 years before white or black spots, called melanosis, start mottling the skin. If the poisoning continues, scaly, leprosylike skin lesions then encrust the palms and soles, eventually rotting into gangrenous ulcers. Finally come renal diseases, cancers-particularly of the bladder and lungs-and death. Determining a new federal standard (USA) for acceptable levels of arsenic in drinking water was no easy task. Now new research adds to the list of ills caused by exposure to the element. According to a study published in Circulation: Journal of the American Heart Association, long-term exposure to arsenic in drinking water is directly related to the development of atherosclerosis in the arteries leading to the brain. A growing number of epidemiological studies indicate that drinking arsenic-tainted water can cause skin, lung, liver and bladder cancers. A 1999 report by the NAS estimated that daily ingestion of water containing 50 micrograms of arsenic per liter would add about 1 percent to a person's lifetime risk of dying from cancer. In the case of Bangladesh it can be inferred that since there are many people who currently have skin lesions caused by ingesting arsenic, many more cases will occur if exposure continues; based on what is known about the relationship between ingestion and the development of internal cancers, it is reasonable to expect marked increases in mortality from internal cancers once sufficient latency has been reached. It is also reasonable to expect marked increases in the incidence of the other health effects listed above. There were no arsenicosis patients in any of the income classes above the 140,000- 150,000 Taka (2, 5 00 US Dollars) household income range. 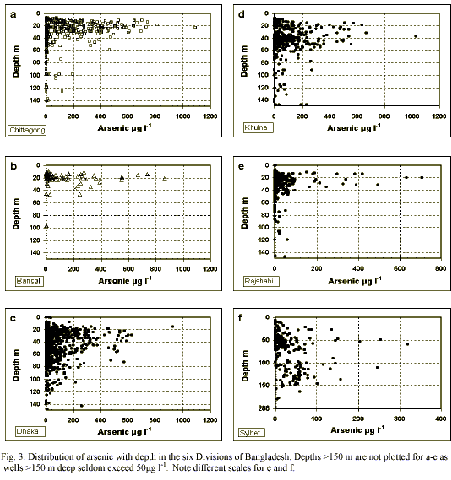 The regression indicates the negative relationship between arsenicosis and household income. Increasing levels of household income are associated with a lower prevalence of arsenicosis. The burden of arsenicosis falls mainly on those living in low-income households (Tani, 1999). In other words, educated persons suffer less than poor uneducated persons. While experts at Dhaka, London, New York, Tokyo discuss, agree and disagree on the source of arsenic poisoning in Bangladesh, we notice, the farmers frequently ask about the source of arsenic poisoning and say that before the use of fertiliser and toxic pesticides about 30 years ago, we did not have arsenic poisoning. They conclude that agrochemical is responsible for the mass poisoning. Fertilisers used in Bangladesh may have put millions of lives at risk, according to a new study by scientists in India. The danger comes from the poison arsenic, which is polluting supplies of drinking water. Two government departments in Bangladesh and four international organisations are facing legal proceedings for allegedly failing to protect the population. Much of Bangladesh's drinking water comes from wells sunk by agencies working for the United Nations. Our study with a limited number of TSP fertilizer samples from Bangladesh show that a high content of arsenic. Arsenic Poisoning in Bangladesh- End of Civilization? Let's remember that we have created a world in which children remain most vulnerable and there is no country in the world where children do not face the brunt of economic melt down, rapid urbanisation, growing poverty, political and social conflict. More than 50 percent of population of Bangladesh is under 15 years age. Per-capita public expenditure on education and health services are amongst the lowest in the world. Allan H Smith, a medical scientist of University of California, who undertook the study for WHO (2000) says at least 100,000 cases of debilitating skin lesions are believed to have already occurred in Bangladesh. "The response to the arsenic contamination is clear-cut, provide arsenic-free water the health of the population is at risk and relief cannot wait for further surveys." Guha Mazumder (1996) outlines a treatment regime for those suffering from arsenicosis. It is suggested that the first stage in treating those with arsenicosis should be the immediate cessation of consumption of arsenic contaminated water. But in Bangladesh most of the arsenic patient does not have access to arsenic free water. Symptoms of arsenic poisoning are mistaken for more lethal disease leprosy or skin diseases, that leads to quarantining due to mistaken identity, in other words, social isolation. The affected are either avoided or discouraged to appear in public. Affected children are barred from attending schools. Young women affected by contamination are often compelled to stay unmarried. The hazard has snowballed into social problems too. The victims find themselves segregated from the society. Either they feel shy to attend any public or social function or that they are discouraged to attend. Women suffer most. "Who will marry them?" says an old woman, Bhanu Bibi, at Miapur village pointing to two school going girls who bear the manifestation of the deadly poison in their bodies. While no one comes up to marry the unmarried women, the married women are turned back to parents or discarded by the husbands and their family. Arsenic pollution in drinking water has been evolved in Bangladesh more for than a decade ago as the affected people has began to die and endless suffering has began for many - in a country where 50 % of the population still reside under poverty line in regard to their ability to secure their food (UNDP, FAO, 1997). Not only education on arsenic but also other environmental aspects in Bangladesh is totally lacking. The Government of Bangladesh, the World Bank, and the Swiss Development Corporation under the Bangladesh Arsenic Mitigation Water Supply Project funds the national screening program. An uncommon partnership between government and grassroots NGOs has been created to implement the program. In addition to conducting the screening, local NGOs will help form village organizations that will decide on sustainable alternative water supply options, oversee operation and maintenance of new water supply and sanitation systems, and help fund the capital costs (The World Bank, Oct. 5,1999). The World Bank began working with other donor agencies and the government to raise awareness about temporary solutions for stopping arsenic poisoning. The active agencies are the UNDP, the UK's Department for International Development, the Netherlands Ministry of Development Corporation, Denmark's DANIDA, the Japanese Government, the Swiss Development Corporation, WHO, UNICEF, FAO, Australia's AUSAID, Canada's CIDA, and the International Atomic Energy Agency (The World Bank, June 2000). "The DPHE/UNICEF arsenic mitigation Action Research Project was implemented in 1999 and 2000 in five upazillas. The project's achievements at the field level included the testing of over 100,000 tubewells, the construction of over 500 alternative water systems (deep tubewells, pond sand filters, rainwater harvesters and dug wells), the distribution of 14,000 home arsenic removal filters (four different household filter designs were used in the project) and the construction of 3 community filter plants. The project also identified more than 900 arsenic patients and provided palliative care for symptom relief. Like the World Bank-funded BAMWSP project described in the case study above, the design of this project emphasized the importance of working at the local level. However, instead of attempting to work directly with a large number of small, local NGOs as was envisaged by the BAMWSP project, the Action Research project designers instead opted for forging partnerships with four large national NGOs. The United Nations Foundation has funded the two-year project, which will be implemented by DPHE, the Directorate General of Health Services (DGHS), WHO and UNICEF in cooperation with the World Bank-funded BAMWSP project, local governments in the sub-districts (upazillas), and six national NGOs and research institutions. In terms of funding and size, the project is an order of magnitude smaller than the World Bank-supported project (roughly $2.5 million versus $42 million) and is restricted to a small area of the country. As such, the project's key objective is not to mitigate the arsenic problem on a national scale, but to develop an approach to arsenic mitigation at the local level that can ultimately be used by larger government and external support agency initiatives." Although the World Health Organization (WHO) recommends that drinking water not contain more than 10 micrograms of arsenic per liter, the wells in Bangladesh were tested to a standard of 50 micrograms per liter. Those delivering water with arsenic concentrations lower than this were painted green, while those that had concentrations exceeding 10 micrograms of arsenic per liter were painted red. While working in Bangladeshi villages, Dipankar Chakraborti of Japavpur University in Calcutta and his colleagues periodically tested water from some of the painted wells and found that they were painted the wrong color. The researchers thus decided to investigate the accuracy of the field test kits used to check the wells. Analysis of water from 290 wells using both the kits and a laboratory technique known as flow injection hydride generation atomic absorption spectroscopy determined that false negatives--that is, green-painted wells drawing water with arsenic concentrations between 50 and 100 micrograms per liter--were generated up to 68 percent of the time. The team then analyzed 2,866 samples collected from colored wells in 60 villages. Of the wells deemed safe, 7.5 percent actually had arsenic concentrations in excess of the limit, the scientists report. In addition, half of the wells classified as unsafe contained water with less than 50 micrograms per liter of arsenic. "Given the scarcity of uncontaminated water," the authors write, "the mislabeling of 50 percent of safe wells has a major socioeconomic impact." We have reported (see Final Project Report) that chemicals of test kits become inert, if they are not kept under 25 degree Centigrade and humid free.Besides in Bangladesh there is any recommened standard sampling and analytical methods (UNICEF, November 20, 2002). The arsenic mitigation programme financed by the World Bank/donors is hopelessly subject to inefficiency, bureaucracy, corruption, lack of capacity, lack of capabilities, lack of professionalism, etc (Hoorens and Koender, Deltf University, Netherlands, 1999). Berlin, 28 August 2002 --- "Political elites and their cronies continue to take kickbacks at every opportunity. Hand in glove with corrupt business people, they are trapping whole nations in poverty and hampering sustainable development. Corruption is perceived to be dangerously high in poor parts of the world, but also in many countries whose firms invest in developing nations," said Peter Eigen, Chairman of Transparency International, speaking today on the launch of the Corruption Perceptions Index 2002 (CPI). "Corrupt political elites in the developing world, working hand-in-hand with greedy business people and unscrupulous investors, are putting private gain before the welfare of citizens and the economic development of their countries," said Peter Eigen. "From illegal logging to blood diamonds, we are seeing the plundering of the earth and its people in an unsustainable way." What is sad about it is that years after the problem was uncovered, villagers in many places are not only drinking water that is contaminated with arsenic but are blissfully unaware that they are being poisoned or that the skin lesions they see have been caused by this poison. This scenario is being constantly repeated around the countryside and smacks of inefficiency on the part of the authorities. Arsenic mitigation programmes in Kushtia and elsewhere in the southwestern region of the country has, according to reports, also suffered a setback due to a similar lack of concern. In fact it may even be correct to say that nobody seems to be responsible for supervising the programmes undertaken either by the government or private NGOs. That people are still ignorant of what has befallen them is hard to accept as UNICEF appointed a publicity agent to inform and educate the people on all aspects of contamination and arsenic poisoning (Sylvia Mortoza, 10. 05. 01). THE NIPSOM (National Institute of Preventive and Social Medicine) doctor was explaining the history of the crisis. He was uncomfortable because the evidence that a cover up had happened was obvious. UNICEF was supporting its feeble efforts to do practically nothing. "The first arsenic carrying tube wells were detected in l993 in Chapainawabganj. We sealed them and prepared a project for the government. But the project was never approved. We have got some money from UNICEF to do some work but no programme exists." "But why didn't you inform the people. Don't they have a right to know? " "We thought it was a local problem. We didn't want to cause panic." Then he stopped. A government officer doesn't know the idea of public rights. He had no answer about rights (The Daily Star, 15. 01. 02). Arsenicosis is basically a case of prolonged poisoning. There is no treatment for poisoning but its impact can be reduced and controlled by intake of necessary vitamins, proper food and safe water. But the situation is difficult because in many cases the patients have lapsed into the secondary and tertiary stage where they suffer from gangrene, cancer, severe internal disorders, neuropathy etc. Since such ailments are directly connected to drinking arsenic laced water, special attention to their treatment is critical. These are not the usual victims of incurable diseases but victims of a bad policy (The Daily Star, 8. 11. 01). SUDDENLY the number of NGOs and foreign experts began to increase dramatically. The Japanese took over a village and started their own experiments. They came to see us and were a bit surprised that we didn't welcome them as others did. At the DF office, Nayeem Wahra said, " In our language, there is a proverb. A poor man's wife is everyone's sister-in-law. Would you allow us to go to any Japanese village and do such experiments?" They had no answer. They never thought that in servile Bangladesh, citizens of donor countries are even asked questions. We were considered so impudent that no discussion was possible. They hurriedly left not sure that this was a proper welcome for the Japanese, Bangladesh's largest donor (The Daily Star, 15. 01. 02). If despite international coverage on the disaster, policy-makers are still unable to comprehend the seriousness of the situation we are in, the nation is in trouble for, if solutions are not in the process of being put in place, they should be. Nowadays, small babies are also showing signs of poisoning (Sylvia Mortoza, 10. 05. 01). The arsenic in the groundwater is simple; applying such remedies as are available have not always been acceptable to the people. The problem with this is that, though many, if not all of these treatments work, if they are not acceptable to people, or people cannot understand the basic concept, these will all become useless as soon as supervision is removed. These projects have been presenting their agenda at international conferences and have informed us about their programmes, highlighted with boldly decorated words on the Internet. But the villagers who are suffering do not know anything about these people. If they bring water samples to DPHE (Department of public health and Engineering) for analysis, they are turned away because DPHE says they do not have chemicals. Shahidul of Wireless Para, Faridpur said, "They give me the wrong results, I compared with Calcutta analysis. After drilling a new well at Wireless Para, they say this water is good but I found that this water is as bad as the water from the well which made me sick." (The Daily Star, 8. 01. 01). We found many tube wells painted green but it should be red. At Vacant Danger, Faridpur a tube well (owner, Md. Zakir Hossain) was recommended for drinking by the World Mission, but we found it to contain 0.5 mg (WHO standard 0.010mg/l) arsenic. At Purobogangabarti we found also wells that were wrongly painted. At Sadipur almost all wells contain 0.5 mg/l but people do not know that their wells are poisonous. Naznin Akhter of village Ambikapur told me that the members of World Mission would obtain deep tube wells although all deep aquifers of Faridpur are arsenic contaminated! We have seen everywhere in Bangladesh NGOs collect money (Tk 5-40) for testing water, although they obtain the money from the aid giving agencies. Many poor cannot pay this amount and their wells are not analysed, the reason behind is that these technical workers after a short training assigned to test water wells on the basis of Tk 15 for each analysis. An analysis with field test kit takes about 30 minutes. They do not get any salary. We have also seen NGO Forum's worker analysing water with inert test kits. We informed from the Faridpur World Mission that this is Community Participation. World Mission has set a handful of Arsenic filter with brick chips, coarse and fine sand but one has to pay Tk. 5,000 or more for so called "Participation". This applied to other mitigation activities. But the poor cannot pay this amount. World Mission has set an expensive filter (Maintenance and disposal of arsenic sludge is only on paper) at Muraidha but at the same place an Open dug hole exists. We could trace very low amount of arsenic (far below Bangladesh standard) in water from open dug hole by Merck's field test kit but could not understand the reason behind the location of expensive filter (Costs about Tk. 25, 000). A new well was dug at Mohammed Shafi's house under arsenic mitigation programme and was recommended to drink.The NGO Forum aided by the Danish Developing Agency and others with impressive offices spread out so called arsenic mitigation network all over the country. Faridpur Sadar is under their project area. While we wanted to start a project in Faridpur, they wrote that they are already working in this area, besides better methods such as three peacher system or two bucket system have been very successful. The fact is that the both systems have been totally failed d. Most of the areas are not yet surveyed and when surveyed wrong results have been handed over to the rural population. It is O.K, if people do not know the result of their water, but it is criminal, if they are told that their water does not contain arsenic or below standard although it is highly toxic and poisonous. Mohammed Zakir Hossain of Alyabad Union informed me that the World Mission has tested their tube well and recommended it safe for drinking. I found the water contains 0.50 mg/l (WHO standard 0.010 mg/l) arsenic. I could not find anything of any arsenic mitigation project of the World Bank/UNICEF/DEPHE/NGOs program for identifying wells, giving alternative choice. These projects have been presenting their agenda at international conferences and have informed us about their programmes, highlighted with boldly decorated words on the Internet. But the villagers who are suffering do not know anything about these people. If they bring water samples to DPHE for analysis, they are turned away because DPME says they do not have chemicals. Shahidul of Wireless Para, Faridpur said, "They give me the wrong results, I compared with Calcutta analysis. After drilling a new well at Wireless Para, they say this water is good but I found that this water is as bad as the water from the well, which made me sick. At Alipur, Faridpur a dug well did not contain any arsenic but all tube wells contain arsenic about 0.50 mg/l and advised the people to drink water from dug well. But they did not believe me and brought the water sample from the tube well to NGO office. They certified the water to be safe. NGO Forum after obtaining grant distributes the project to other NGOs and other NGOs give work order to other. This is like World Banks millions of dollars credit for coconut plantation project in the coastal areas of Bangladesh. If planted truly, coastal area of Bangladesh would have become paradise of coconut trees! No one is responsible as the assignment changes hand. According to the World Bank, Government of Bangladesh has to give tender for the "Arsenic Mitigation Project". Lack of honesty, know-how and capability will destroy to achieve any project goal, irrespective of most modern controlling mechanism. We recently visited (April, 2002) NGO Forum Office at Faridpur and asked for their program for arsenic consciousness education. A few booklets were presented to us and it costs Tk. 200. Who can buy booklets for Tk. 200 (two days salary of a daily worker)? NGO Forum has published an impressive "Diary 2002" from project money and distributed among high officials, ministers etc.!!! In areas where deep tube wells are not feasible, it is possible to treat surface water from ponds that are exclusively reserved for drinking purposes and to make it safe for drinking and cooking. DPHE, supported by UNICEF, has designed a community-based slow sand filtration system, called a pond sand filter, which can remove bacteria from surface water by filtering it through a large tank filled with sand and gravel The construction cost was Taka 1,50,000 for the PSF itself and Taka 2,00,000 in total inclusive of other expenses incurred for re-excavation of the pond, fencing, and the removal of a lavatory (JICA, 2000). The level of coliform bacteria is very high even after treatment of PSF (Total coliforms 1500-7000 /100ml) Due to high initial loads of bacteria in the surface water of Bangladesh; PSFs will rarely succeed in removing all bacteria. Construction cost is very high. (BRAC, 2000). In Faridpur NGO Forum constructed PSF at a place where arsenic concentration of the tube well water is below Bangladesh Standard. Now the PSF filter is clogged, pipeline from the pond disrupted. No body uses PSF (Picture). Money spent for whom? . Dug wells are easy arsenic free alternative, an indigenous technology with very high social acceptance. . If constructed and maintained properly, dug wells provide alternative arsenic free water. But NGOs in Bangladesh took little attention on it. Under Arsenic Mitigation Project 1999-2000 NGO Forum constructed 3-4 dug wells in Faridpur. We came to know from the villagers that these dug wells were constructed during monsoon season, when the ground water level was high. Besides the contractors used low cost materials that have now caused splitting of cement rings. Under the same mitigation project (UNICEFs support) BRAC, the largest NGO of Bangladesh, intended to construct two new dug wells in Jhikargachha upazila but failed (BRAC, 2000). But we have constructed 13 new dug wells in six weeks (March-April-2002). A failed rainwater harvesting unit. Now villagers use contaminated water from the tube well. The rainwater harvesting unit failed from the first day. The sand-filter they made was unable to filter water. Villagers say that sand used for filter had collapsed water and later no water could flow. "We never used rain water, as it does not work from the first day." Now they have disrupted all connection. Rain water collection is the cheapest from all methods. Professor Quazi Quamruzzaman, a leading Bangladeshi surgeon, says that the situation, though desperate, is not insoluble. What is required, he argues, is a change of emphasis from drinking groundwater – which in many cases is contaminated by arsenic – to drinking surface water, of which there is plenty in rainy season Bangladesh. "All our investment by government and international agencies is in groundwater," says Prof Quamruzzaman "and not the surface water. Anywhere the groundwater is used for drinking purposes there is a problem. If we can collect the rainwater we can use it. This way we probably will be able to increase our arsenic-free drinking water by about 80 percent." A deep tube well that replaced his 16-year-old arsenic-affected hand pump well has hardly solved the problem. "But we cannot drink its water because of bad smell," Sikdar complained. Many Bangladeshis can ill-afford Tk. 40,000 to 50,000 to install a deep tube well. (The Independent, 27. 08. 99). Under the name of Arsenic Mitigation several hundreds of deep tube wells have been sunk by donors/Government after the publication of the report by British Geological Survey and Mott MacDonald U.K Ltd, DPHE (Govt. of Bangladesh) that most of the deep tube wells are arsenic free. BGS reports (1999): Available data shows that aquifers deeper than 150 - 200 m are essentially arsenic-free over much of Bangladesh. The depth distributions in Fig. 3 show to be fallacious the belief that drilling Deeper than 100 m provides arsenic free water; it will do so in some parts of Bangladesh, but not, for example, in the region of the Sylhet Basin. Below 200 m, arsenic concentrations rarely exceed a few micrograms per litre (Frisbie et al. 1999; DPHE 1999; Fig. 3). Deep wells, tapping depths greater than 150-200 m, almost invariably have low arsenic concentrations, less than 5 µg l-1 and usually less than 0.5 µg l-1 (BGS and DPHE, 2001). Arsenic found in ground water in 28 municipalities! Thousands of people of 28 municipalities of the country are drinking arsenic contaminated water from pipeline water supply system, a recent study has revealed. Earlier, it was believed that the wells including the deep tube wells in the municipalities posed no threat to public health since they were safe. The tests carried out by the Dhaka Community Hospital (DCH) in cooperation with The Daily Star were done between January and September 2001. The municipalities include the hill district of Rangamati where, until now, experts rule out possibilities of finding arsenic even at low concentration. Laboratory tests of water samples collected from the municipalities revealed that all of them including those from privately-owned wells contained at least 0.03 milligram per litre arsenic or three times the acceptable level (0.01mg/L) for human consumption. For Bangladesh, the highest level of arsenic in drinking water is 0.05 mg/L. Atomic absorption and spectro-photometry, two of the world's best and most reliable methods, were used to test the samples. Two separate tests were carried out for each of the 324 water samples. One set was tested at the laboratory of the DCH while the other was sent to Jadavpur University in Kolkata, India for a second opinion. According to the World Health Organisation (WHO), long-term consumption of arsenic can cause various skin diseases. Experts studying some arsenic patients have concluded that long-term exposure to arsenic through drinking can lead to cancer in the bladder, intestine and even lungs. The DCH study found the highest concentration of 0.199 mg/L arsenic in a deep tube well in Gopalganj town that supplies water to more than 12,000 inhabitants. The second highest concentration was found in another Gopalganj town deep tube well supplying water to more than 10,000 people. This one has an arsenic concentration of 0.177 mg/L. In Chuadanga town, a 170-feet deep tube well, which is shared by some 20 families, has a concentration of 0.42 mg/L of arsenic. The users have been drinking from the well for the last six years. In Kishoreganj and Laxipur district towns, similar concentrations of arsenic were detected. In Kishoreganj, a privately owned well showed presence of arsenic at 0.183 mg/L while in Laxmipur 0.267 and 0.140 mg/L arsenic was found. Similarly, high concentration of arsenic was detected in Magura, Manikganj, Narail and Kushtia district towns. According to the latest data, 85 million people in the affected areas are at risk of drinking arsenic contaminated water. (The Daily Star, January 4, 2002). Local contractors are happy to install a well at a cost of 50-100 thousand Takas on conventional method without protecting upper contaminated aquifers. UNICEF has allocated 2 million dollars to DPHE for installation of some 5,500 water points such as deep tube wells (Lockwood, UN Resident Co-coordinator, Feb 27-28, 1999). Such drilling has now contaminated most of the deep aquifers of Faridpur, Kustia and other northern districts. In their own countries construction of deep wells on contaminated water is strictly prohibited. On 18th July 2001 news on national TV announced successful completion of several hundreds of deep tube wells. Now, who will be responsible for contaminating deep aquifers? In Kishoreganj and Laxmipur district towns, similar concentrations of arsenic were detected. In Kishoreganj, a privately owned well had presence of arsenic at 0.183 mg/L while in Laxmipur 0.267 and 0.140 mg/L arsenic was found. (The Daily Star, 10. 01. 02). Similarly, high concentration of arsenic was detected in Magura, Manikganj, Narail and Kushtia district towns. A total of eight teams collected water samples and other data. People at risk from drinking arsenic at high concentration were informed in writing. The Department of Public Health and Engineering (DPHE) was also informed about the status of arsenic concentration. (The Daily Star, 10. 01. 02). However, according to sources, none of the deep tube-wells with high concentration of arsenic have so far been shut down. Only in Southern Bangladesh shallow contaminated aquifer is separated by thick clay deposit allows to drill deep aquifer by conventional drilling method. Rest of Bangladesh's aquifers (shallow and deep aquifers) are irregular. But uncontrolled deep drilling accelerated saline intrusion. Conventional methods of drilling have further contaminated uncontaminated deep aquifers. The use of plastic pipes, which cannot be recovered completely by abandoning a well have further, accelerated contamination of deep aquifers from overlying contaminated aquifers. To identify the number of arsenic contaminated tube wells; label them with the colour red for dangerous ones and green for safe ones. Conduct surveys for arsenicosis patients. To provide deep tube wells as an emergency measure in those locations where most of the tube wells are found to be contaminated by arsenic (as aquifers at the level below 800 feet are found arsenic free). Health Engineering Quadiruzzaman and UNICEF representative Shahida Azfar, among others, joined the two-day UNICEF sponsored expert conference titled "Arsenic, Nutrition and Food Chain (1998)." The agriculture secretary said no extensive studies were yet to be carried out if the arsenic in aquifer had any affect on crops as all concerned still concentrated their attention on drinking water (1998). Some reports show that stopping the ingestion of contaminated water may alleviate existing symptoms and drinking arsenic-safe water appears to lower the long-term risk of developing diseases. There is some evidence that providing patients with vitamins, especially Vitamin A, Vitamin C, Vitamin E and an enriched diet aids recovery. For this reason, patients are advised to eat plenty of vegetables, especially leafy greens. The analysis result of the total arsenic concentration of 21 rice samples of Samta produced which is a high-concentration arsenic pollution (JICA, 1999). One sample of Samta produced rice, which is an arsenic pollution ground, was comparatively as high as 0.94 ppm. The significant difference was not seen in an average of rice of the pollution ground and the rice made in Japan. The arsenic concentration of rice of the pollution ground was 2 to 2.5 times other local average value of Bangladesh. Some rice contains High Arsenic as 1.0ppm, rice of these pollution district needs to be blended and needs to lower arsenic concentration. Or a high-concentration producer's rice is discriminated and it is thought that it needs to remove from circulation (JICA, 1999). Agriculture through contaminated ground water is now contaminating our food chain. There is no programme to go back to traditional method of agriculture. Government has no programme on "flood water" irrigation. Wilcock, an irrigation expert, who visited Bengal in early 19th Century, was overwhelmed to see irrigation system in Bengal. He expressed, "river water in the early months of the flood is gold". 2.5 billion tonnes of fertile soil carried by the Ganges-Brahmaputra Rivers goes directly to the Bay of Bengal." Flood irrigation system is the only alternative. It will not only stop contaminating food chain and surface water but also reduce use of fertiliser. As we notice after each severe flood, a bumper crop in Bangladesh is recorded. The picture of a young man waiting to die as a result of the horrific effect of arsenic poisoning in a Dhaka hospital (Daily Star Oct 31. 01.) shows how bad the situation is. Although it has been almost eight years since the well-kept secret of the government was pried open, things haven't improved. While there may be some movements in the water management sector very little is being done in the case of treatment of patients (The Daily, Star, 8. 11. 01). People do not have any alternative but to drink poisonous water, (Photo April, 2002). Although there are reports that the government is pondering digging some covered ring wells with hand pumps to alleviate the problem of a shortage of arsenic-free drinking water, generally it can be seen that little has been done to implement this plan. Although the DPHE has a scheme to install 40 ring wells within the district, still no ring-well has been installed despite the selection of contractors. The officials are not even sure how many people in their area are suffering from arsenic poisoning, although an unconfirmed survey report does say that 40 per cent of the people are sick. When asked, these officials are likely to blame the shortage of manpower as the reason for the lack of action but as Arsenic Control Committees have been formed at the grass-root level, (i.e. the ward level to district level) no programme for creating an awareness among the people about arsenic contamination, water management, nutrition or which measures to take to face the arsenic threat appears to have been taken up (Sylvia Mortoza, 10. 05. 01). Deep Tube well (where suitable aquifer is available). Dug/Ring well (where technically feasible). Treatment of surface water (adequate quality and quantity). Treatment of arsenic contaminated water. Proven safe and sustainable technologies implemented under short-term options. Government program to educate every one in Bangladesh by year 2 000, but I think to reach year 2000, it will take us 5 000 years.